creative savv: Unseasonably warm winter or confused daffodil? Unseasonably warm winter or confused daffodil? Yesterday began as a kitchen day. It had been a while since I did a fair amount of baking (and we were almost out of bread). I baked 4 loaves of whole wheat sandwich bread, a dozen cinnamon-raisin buns, a batch of cinnamon granola, a small batch of cupcakes (my sweet tooth kicking in), and I made a quart of Greek yogurt. I finished up just in time for a gorgeous day to come to my yard. I was able to have lunch on the deck, haul one of the laundry racks outside to dry a load of clothes in the almost-spring air, and wandered into the garden to check on the bulbs that I planted this past fall. 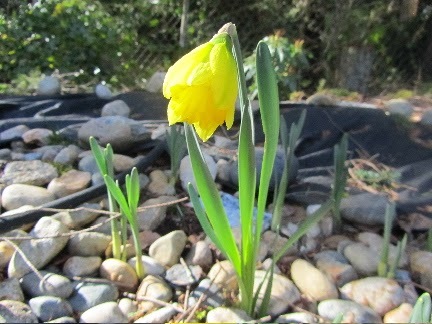 That's when I spied this daffodil all poised to bring spring to me! Alas, the sneak peek at spring was short-lived. Rain and cooler temps are expected to return later today. Now for the boring part of this post (boring for you, maybe, but exceedingly helpful for me). I spent a good share of Tuesday afternoon rereading last year's January, February and March grocery journals. January and February were low-spend grocery months, but March was quite high. We could afford that last year. But our budget has changed since then. Not wanting to repeat some of the excessive spending from last March, I took some time to look over the journals. I was able to pinpoint some particulars to avoid for this March, hoping to be more mindful of our budget. To that end, I am mentally preparing for potential sales and mark downs. Deciding in advance, should specific foods come up for sale this next month, how much am I willing to spend on each, and how much in quantity am I willing to stockpile. This is an important step for me. If I establish my boundaries in advance, I am much more likely to keep my spending in check. I mention all of this, as keeping records has helped our household live within our means, regardless of income. Writing it down (or typing it up) keeps us accountable. Just knowing that it will be recorded somewhere keeps a check on a good deal of my spending. It's like a budget report card. The written record is the evidence of good or poor spending choices. In addition, this record gives me something to look back to, evaluate and learn from. When I'm feeling down about our finances, I can look to success in meeting our budget, and remind myself that we're doing well given our circumstances. And, I can reflect on our spending and find areas for improvement, or pitfalls to avoid. I feel confident that we'll be able to reduce our grocery costs for this March, as compared to last year. A bit of preparation makes all the difference for me. I feasted my eyes on that daffodil, having just come back inside from shovelling another 6" of snow off the drive. Snow is still coming down heavily, so no doubt it'll be done again later. I sure hope that spring comes soon to your area! But not too quickly (I keep hearing about the possibility of flooding in the next month). Ooh, lovely. No chance of flowers any time soon where I live. I have a question, before you began your blog, did you record grocery spending then, too? If you did, how did you find it best to do so? I've been recording what we spend on groceries for about 18 years. I did it all long-hand in a notebook. But, my records weren't as detailed. I would have written what items I bought, and the total of what we spent, but not individual prices. Those records helped me find patterns in sales, so I would know when to expect the next sale, and how much to stock up. Having a computer has changed how much info I can easily log. Entering prices, amounts and where I spend for groceries is much easier with a computer. This is not in response to the daffodil post but rather sourdough starter post. Here's my deal. Months ago my daughter gave me the amish friendship bread starter and over time I would continue to feed it minus all the sugar. I use it once in a while in bread. It looks and smells like a true sourdough starter probably minus the yeast. But doesn't the yeast become less and less in a traditional sourdough starter over time anyway? Each time you feed it and use it really contains less and less of the original yeast, doesn't it? My problem is that I will use enough starter along with new yeast and other bread ingredients but the bread crumb after it is baked is so coarse and not the soft fluffy bread. I have a similar problem with non sourdough breads as well. We moved to a different home 7 months ago and both homes have well water but my "old" home made better bread than the "new" home. Any ideas for me? I have tried substituting milk instead of water but to no avail. So, when you use your Amish starter, are you making the traditional Amish Friendship bread, or just a regular sourdough-type bread? Homemade sourdough isn't a soft, fluffy bread, at least not for me. But anyway, you have this same problem with regular yeast breads, too. If you're making a whole wheat bread, you could add a bit more white flour. Even just a small amount of extra white flour can make a difference in texture. My other thought is your water. Although both houses are on well-water, the mineral content could be different. Very hard water makes it difficult for yeast to do it's thing. Very soft water is also not good for yeast. Water with medium hardness (100-150 ppm of minerals), is best bor yeast bread. You could try one batch of bread-baking, using bottled water, in place of tap. Also, alkaline water inhibits yeast growth. Soft water (ph of just below 7) is great for yeast bread. 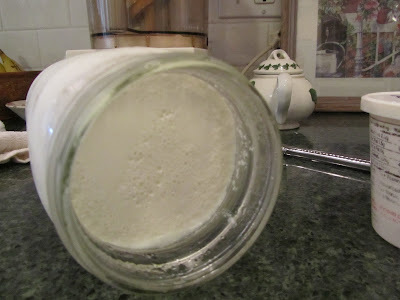 As for what happens with yeast in sourdough starters, this is what I understand. Each time you feed the starter (to keep it going or to use it), in the early days, you give the micro-organisms food to reproduce. So, the yeast is several generations old over the first few weeks/months. Not necessarily less yeast, just many generations removed. In addition, the starters pick up wild micro-organisms from the air. With even more time, these wild yeasts can over power the commercial yeast (if used as starter), and give your starter a closer to old-time flavor and aroma. And yes, then the commercial yeast could die off. It does sound like you're going to need to do some experimentation. Try rising at a cooler temp. Try the wheat gluten, and see what happens. If no better, try bottled water. Just keep experimenting, and if you have a local grain/natural foods shop, you could ask around in there, if others in your area have trouble with baking bread. I would be very interested in hearing what finally works for you. Good luck with this, Alice! We are having bitterly cold temps and are smothered in snow but yet, close to house (by the dryer exhaust) I think I see some crocuses coming up. Hardy little things! Your budgeting journal sounds like my weight loss journal--sometimes you get good insights when you look back and realize what patterns have been established. I've never thought of doing it for groceries. Good idea. I had forgotten about crocuses until reading your comment! When I was a child, my Mom had some in our front yard. I remember many years seeing them in bloom when there was snow on the ground...amazing! They are like a reminder to hang in there until Spring. You know, if I lived in your house, I'd plant a little pre-spring garden right there in front of the dryer exhaust. I would plant primroses, crocus and snow drops. Then each year in late February I would have a taste of spring to cheer me! My journals also keep me from beating myself up when we have a high bill. The electric bill for December is always substantially higher than other months, and I used to freak out when I opened that bill each year. Until I realized that this happens year after year. My early taste of spring is exactly as you say, a reminder to just hang in there a little longer. It's not because of snow, here, but the days are cold and dark still. I need that sunlight! Yes I've seen my first daffs this week too, on the way to work. It's been a very wet but mild winter here and I keep looking at my pots of still-alive geraniums outside the front door and wondering whether this will be the first year that they will overwinter outside and live another year. It will be good from a frugal point of view - no need to buy bedding plants - but not so good for the planet...a definite sign of climate change? 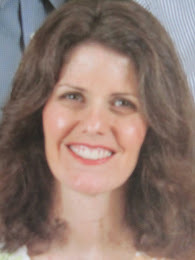 My scientist hubby would say that you can't look at one or two years in isolation--you have to take several years and look at long-term trends. From where I live, if I were to take this year in isolation, I could possibly conclude that we are entering a new glacial age. We will be entering our fourth month of significantly lower-than-normal temps and many areas have seen record snowfalls. It will be interesting to see what the scientists make of the world-wide weather this year. I don't have geraniums here (but that's a good idea for this coming summer garden), I do have primroses. The ones close to the house never did stop blooming. I have heard that you can bring small pots of geraniums indoors over winter, to keep them going from year to year. I just love looking back at old entries and seeing what I did in the past. It really does help me to plan better for the future. I know! Aren't those records revealing and helpful?! As I get older, it's harder to remember what I did the past year. I couldn't remember what we did for our daughters' birthday breakfast last year, until I reread something. (It was blueberry pancakes with real maple syrup -- a huge treat for us here). Okay, daffodils and crocus have been spotted. I need to go on a hunt to see what I can find. I hope I find something similar because right now all I see are snow and mud. I'm sure you have at least one daffodil or crocus popping up somewhere! Happy hunting! You're just so organized... wish I had a bit more of that in me. Anyhow, I'm with the daffodil - Bring On Spring!!!! I'm really not that organized, at least not naturally. That's why I have to put all these "systems" into place. Otherwise, dinner wouldn't make it to the table until midnight, bills would go unpaid, and my grocery shopping would be rather erratic. In fact, all of this was true in the very early days of living on my own. We might get snow this weekend, so I'm contemplating clipping that one daffodil. I don't want snow to bring it to an early demise.